Northend United under-12s turned in the Club’s performance of the week in a pulsating NIBFA Plate game against Greenisland. Calum McMurray scored the all important goal in the second period of extra time to take the Northend boys into the last 16 of the competition. The U11s again put in a good performance against Irish league academy side Carrick Rangers with a well deserved 1-0 win as they warm up for next weeks NIBFA Cup match against Hillsborough Colts. In the Daily Mirror Lisburn League Match of the Day, the U13s lost against Newry side, Windmill. Elsewhere in the Lisburn League there were defeats for the U16s and U17s against Hillsborough and Annagh United respectively. The U10s three teams were in action in a mini tournament held at the Showgrounds on Saturday morning competing against teams from Carniny, Coleraine and Ballymena. Carrick Rangers Colts 0, Northend United 1: After a scoreless opening period, the decisive moment came five minutes into the second half as Ben O’Neill battled to win the ball and played it through to Jay McKeown who raced through one on one with the keeper and slipped the ball to the keeper’s left leaving him no chance as the ball rolled into the back of the net for the only goal of the match. Northend dominated the rest of the half with O’Broin and O’Neill having several chances but they just couldn’t find the second goal. Northend came close to a second goal when Ben O’Neill spread the ball wide to Billy Bell who played it across to O’Broin who made the space for a left foot effort that the Carrick keeper saved brilliantly putting the ball over the bar. Northend: B Adams, C McAvoy, B O’Neill, S Bristow, S O’Broin, J McKeown, B Bell, K Wakefield. Northend United 1, Greenisland 0: A place in the last 16 of the NIBFA Plate was up for grabs and that was reflected in a scoreless first half. 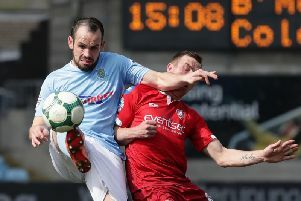 The scoreless stalemate persisted throughout the second half as the tie moved into extra time where Callum McMurray almost edged his side in front on three minutes following a good through ball from Kevin Cosgrove; although Curtis Wilson made a brilliant save from a thunderous Greenisland shot in the final moments of the first period. Northend continued to dominate the play and boys got the reward for all their hard work in the opening minute of the second period. David McKay intercepted an upfield ball and played a lofted pass behind the Greenisland defence for the run of Kevin Cosgrove. The midfielder beat a defender and cut a ball across goal towards Callum McMurray who was on hand to smash the ball high into the roof of the goal to the roar from the home support. Northend: C Wilson, D Magill, J Adams, O Campbell, K Cosgrove, J McIlhatton, T Mitchell, K Barr, L Hector, D McKay and C McMurray. Windmill 4, Northend United 1: Northend struggled against the physically stronger Windmill side but kept them at bay until the last five minutes of the first half when an unfortunate rebound off a windmill player fell kindly into his path and he made it 1-0. The second half was much better from Northend, but a lapse in concentration saw Windmill score 3 goals in 6 minutes. Two could have been prevented but poor clearances from the defence allowed Windmill to capitalise. At 4-0 the score didn’t really give justice to Northend, the boys found the bigger pitch hard to cope. With so much space for both teams to try and cover it was a tough experience. However Northend rallied and deservedly got one back through a Patrick Ferris penalty. It was his pace and run down the right that he was upended in the box. Panel: J Morrow, J Montgomery, P Esler, H Wylie, C Campbell, P Ferris, C Higgins, R McQuillan, R McKillop, A Campbell, C McGaughey and J Casey. Hillsborough 3, Wakehurst 0: Despite Wakehurst missing a few regulars and Anthony Shaw volunteering for goalkeeper duties at the last minute they were on top for most of the first half without creating any real clear cut chances. Midway through the second half, lack of concentration led to Hillsborough opening the scoring against the run of play and late in the game they ran in another two to take the shine of another impressive performance. Wakehurst: A Shaw, J Penny, B Millar, D Dobbin, J Stevenson, A Campbell, R Laverty, J McLarnon, T Barr, D McCalmont, J Fleming, M Kirk, M Erwin, R McCluney. Annagh United 2, Wakehurst 0: This was Wakehurst’s first match since before Christmas and it showed in the opening minutes. Wakehurst conceded a goal after three minutes when some defensive frailties allowed the Annagh striker to outpace the chasing defenders and plant the ball into the bottom of the Wakehurst nets. However Wakehurst rallied before the end of the half and saw a Jamie Timms corner headed off the Annagh goal line with almost the last kick of the half. Into the second half and a resurgent Wakehurst took the game to Annagh. A Jamie Timms free-kick found Robbie Dennison at the back post but his header went inches wide. Tom Campbell was next to see his shot trouble the Annagh keeper and the Annagh keeper capped an inspired display went he got down low to his left to push a Cairns free-kick around the post. Five minutes before the end of the match, Wakehurst conceded a second goal from a corner kick, when the Annagh striker was given too much room and planted the ball into the Wakehurst net. The Football Development Centre is open to all boys and girls aged 4 to 8 inclusive and is under the direction of Northend’s Uefa B and Coerver certified Head Coach, John Devlin. The Club is organising a Last man Standing Competition - starting with Saturday 6th February football results. Entry fee is only £5 per person and needs paid by 30th January to any team coach or committee member & text your details to 07419 131693.